The same exact event can reinforce the existence of God for one person and reinforce the atheism of another. A single occurrence can make one person feel more politically liberal and make another person feel more conservative. Reflections like this make me reconsider how I feel about people I disagree with. Often, they’re just processing the world a little differently than I do. That doesn’t make them bad or evil. In fact, it’s an opportunity to understand the world a bit better. You don’t just wake up one morning and find that you’re successful. Instead, if you spend a day working hard on being a success at whatever you choose, you can go to bed knowing you’re just a tiny bit more successful than the day before. So often, I’ll find long magazine articles or essays online and I wish I had an easy way to read them offline. Instapaper solves this problem incredibly well. This tool enables you to “bookmark” long articles for later reading. Instapaper does a pretty good job of just extracting the text from those articles. It then makes these articles available to you in a bunch of different ways, from pages you can print yourself, documents you can read on your Kindle, or a reading tool for your smartphone or iPod Touch or iPad. I’ve read so many interesting and valuable things because of this tool. Van Gogh is my favorite painter of all time. Often, you can look at his paintings as a whole and have a feeling that they’re simplistic, but when you look at the detail that went into assembling the effect, you’re stunned at his work. 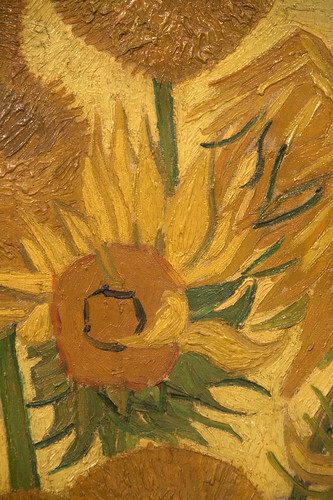 If you’re ever in an art museum and standing in front of a van Gogh, look closely at the detail of his work. It’s amazing. It’s impossible to absorb everything in modern life. The trick is to put your own twist on it. Simply put, you choose what you absorb into your life. Do you absorb something deep and insightful? Do you absorb whatever’s on TLC? Do you think about what you’ve learned and mix it with what you already know? You make your own mix. Presentations like this one make it very clear how corporations view the people that buy their products. You are someone to be charmed. If you allow yourself to be charmed, your money will vanish from your wallet. Avoid the charm. Look for the best bang for the buck that solves your problem and then walk away. If you want to do something amazing in your life, remember that hard work is the thing that underlines it. Working on The Simple Dollar outlines this for me every day. There are so many little things that happen in the background to make this site work that aren’t fun. They’re tedious and often personally challenging. Without them, though, nothing else would work. This goes somewhat hand-in-hand with the Instapaper recommendation above, but this stands on its own, too. Long Form is just an aggregation of great pieces of long-form nonfiction that can be found online. If you really want to learn more about the world, stop in here a few times a week and read a few of the articles. You’ll grow in ways you never expected. Simone is a fantastic classical pianist. She played a free concert at a prison, one that would probably have never been noticed by anyone had it not been for someone taping it with a handheld camera and sticking it on YouTube. If this contributed some positive value to even a few of the people in attendance there, it was well worth it. Things like this, at the right time in a person’s life, can make all the difference, and that’s why art is incredibly valuable to culture. My children have taught me so much about relating to people. Ben Franklin does a great job of spelling out some of those insights. If I tell my oldest son how to throw a ball, he might try it, but there’s a good chance he’ll still do it wrong or he’ll just not even attempt it. If I go out there and show him, he has a better chance of picking it up. On the other hand, if I play catch with him for a while and coach him on how to throw with each toss, he gets better and better until it becomes natural. There’s a very valuable lesson about life in that story.